Katie Bennett (B.S. 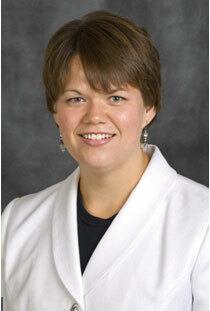 '03) is currently the Assistant Director of Alumni Affairs for the SIUE Office of Alumni Affairs. After graduating from SIUE in 2003, Bennett worked as the Events Manager for Junior Achievement of Mississippi Valley. Bennett completed an internship at KMOX Radio in St. Louis while attending SIUE, and when given the opportunity to return to the radio station, she jumped at the chance, Bennett became Events Manager/Webmaster for the station, the job seemed perfect for her because "I enjoy the logistics of event planning and the creativity of web design." As Assistant Director of Alumni Affairs, Bennett focuses on electronic communication, web content, event management, membership benefits and volunteer opportunities, "Our main mission is to help enhance the personal and professional advancement of SIUE alumni through establishment of mutually beneficial relationships that support SIUE," said Bennett. Alumni Affairs regularly communicates with 80,000+ university graduates and 5,000 association members through letters, e-mail and their web site. One of the biggest challenges of the Alumni Association has is maintaining a balanced communication system. The Association must "balance communication with graduates without giving out too much information or contacting them too often," said Bennett. Advancements in technology and what form of communication is most effective are key considerations for the Association. Deciding between emails that can be sent straight to spam filters or printed newsletters is both a communication issue and an economic issue due to the cost of printing and mailing. Bennett remembers two very influential and helpful professors at SIUE, Mike Montgomery and Judy Meyer (both now retired). Montgomery was Bennett's faculty advisor and helped her choose corporate communications as her Mass Communications emphasis. Meyer inspired Bennett to concentrate on Public Relations, "demonstrating how applicable the skills can be in all industries. Meyer remembers Bennett as an exceptional student and person. "Her grammar is impeccable-and her assignments are always clear in purpose and interesting! In fact, I have asked her permission to read some of her materials to future students as examples of stellar work" commented Meyer. Bennett earned her degree in Mass Communications with a minor in Speech Communication. Bennett advises anyone who chooses to pursue the same profession to "build a portfolio" and volunteer at a local non-profit or your school for on the job experience. After graduation, Bennett found that competition for jobs against people with three to five years of experience was the major hurdle, so gaining experience through paid and unpaid PR work is very important. Outside of work Bennett enjoys, like most CAS graduates, time with her family and friends. She also enjoys reading, writing, photography and time away from her computer. "I love cooking. In fact I'll soon be hosting my first sushi party after getting inspired at a sushi class at the Kitchen Conservatory," said Bennett.